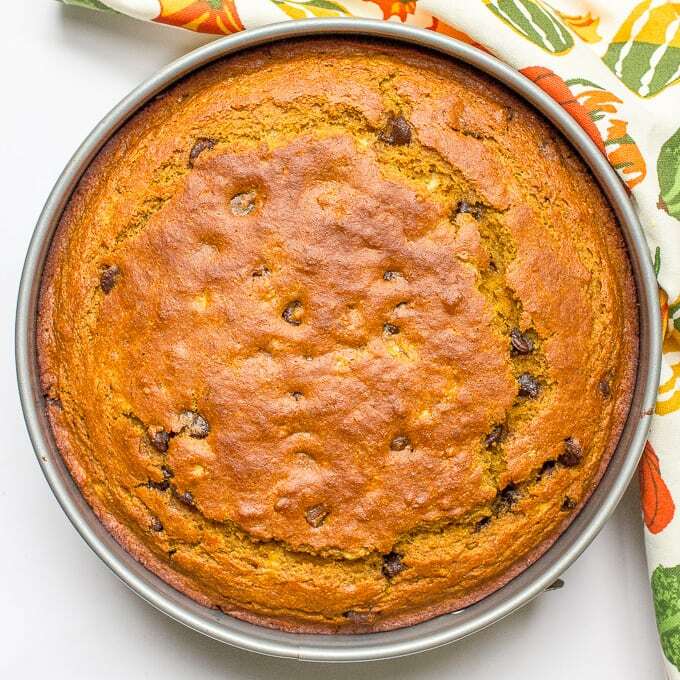 A slightly healthier banana pumpkin chocolate chip cake recipe with rich chocolate flavor, a hint of cinnamon and tall thick slices – a delicious fall dessert! I hope you’ve had a great week! The weather is starting to cool off here, so I pulled out some of my fall clothes and I’m feeling very ready for cooler days ahead! I also got a case for my new iPhone 7 and couldn’t be more happy with it. It’s the little things, right? Today, we eat cake. 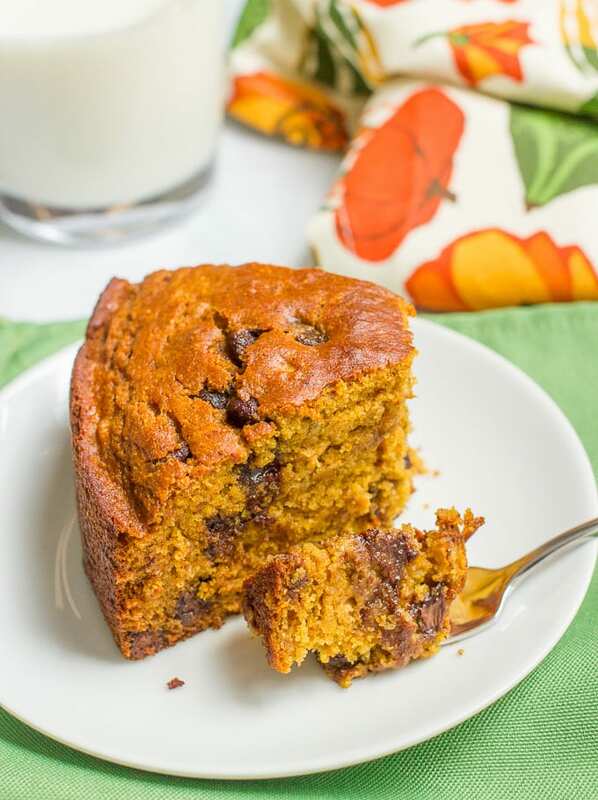 Pumpkin chocolate chip cake. 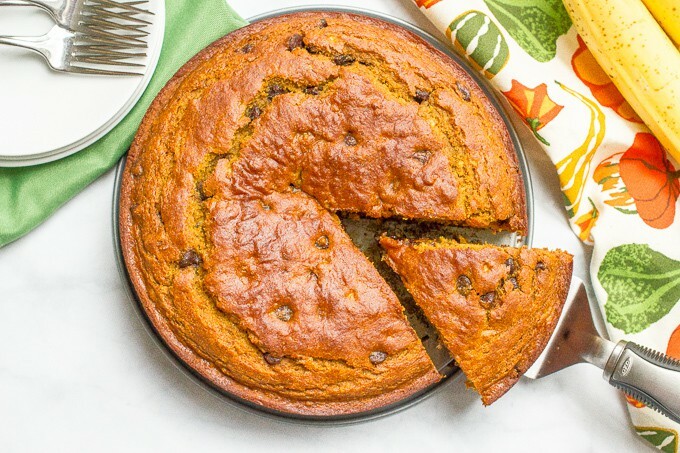 Banana pumpkin chocolate chip cake. 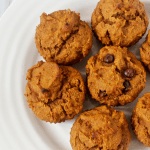 Warm, rich pumpkin-infused chocolate flavor with hints of cinnamon spice in every bite. 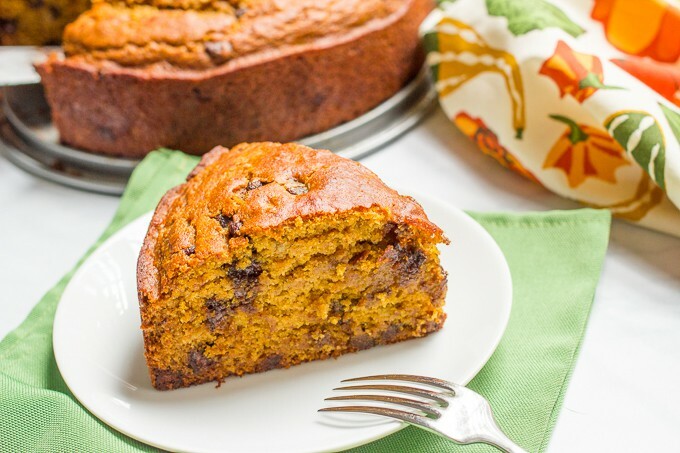 It’s sweet, it’s moist and the slices are OH so tall! 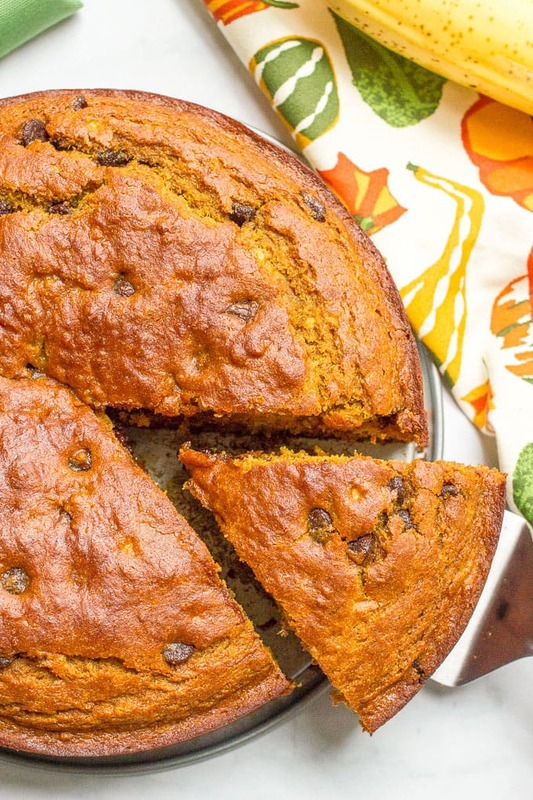 This cake is your fall baking project homework. You just gotta make it! It uses whole wheat flour. 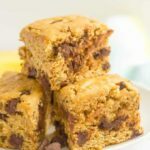 I always opt for white whole wheat flour – all the healthy and whole grain benefits of whole wheat flour but it’s lighter and not that big of a taste difference from all-purpose flour. It’s naturally sweetened, with banana and honey. There’s just 1/4 cup of butter for the entire cake. Not bad. You don’t really taste the banana in the cake. 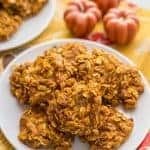 It just adds sweetness and texture and helps keep this lightened up a bit. Don’t sub applesauce for the butter. I tried this — cause I do that often in baking — and the texture came out a little funny. I think the triple combo of banana, pumpkin and applesauce was just too much. 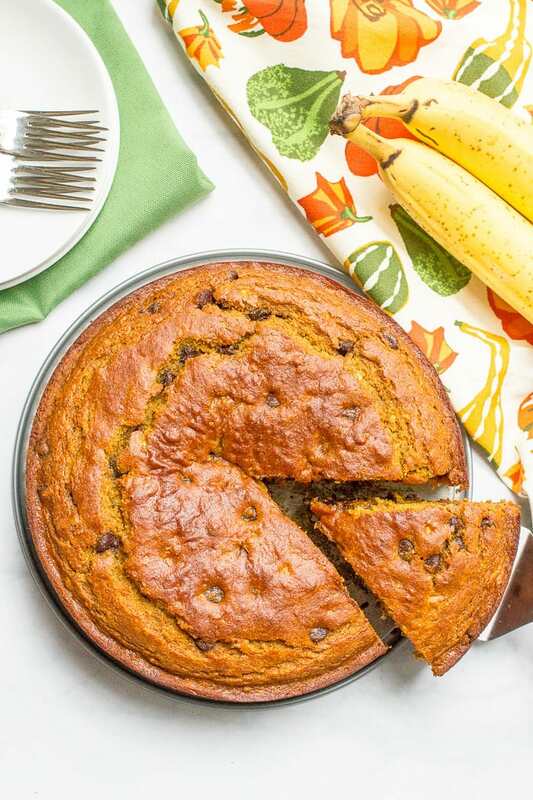 This (slightly) healthier banana pumpkin chocolate chip cake is a delicious fall dessert! In a large bowl, mix the flour, cinnamon, baking soda, baking powder and salt. In a separate medium bowl, mash the bananas with a fork. Add the eggs and whisk together. 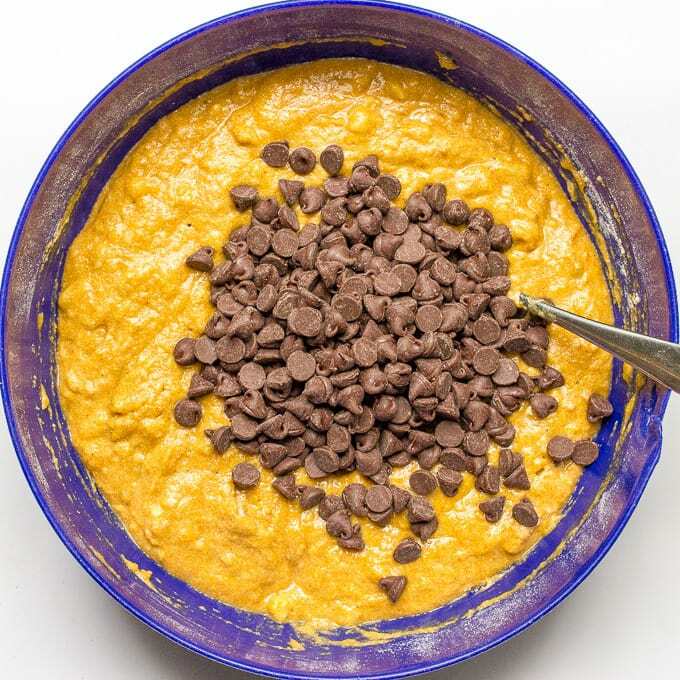 Then add pumpkin puree, honey, milk, butter and vanilla and stir well to combine. Add the wet ingredients to the dry ingredients and stir until just combined. Fold in the chocolate chips. Pour the batter into a well-greased 9-inch springform pan. Bake at 350 for 40 minutes, or until a toothpick inserted into the center comes out clean. 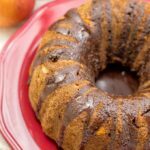 Remove the outer ring of the springform pan and let the cake cool before slicing and serving. I’ll take a slice for breakfast! A woman after my own heart — it’s totally breakfast food 😉 You will LOVE the iPhone! May take a little getting used to, but it’s so great!! Haha, right?! Have a great weekend Tara! 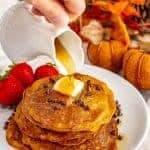 does this recipe work the same with regular white flour or do I have to adjust the amount? Hi Julie! Yes, you can substitute regular all-purpose flour here in a 1:1 ratio and it should work just fine. Hope you try it! Would love to hear what you think! Thank you Kathryn. I’m new to your site and I really like it. 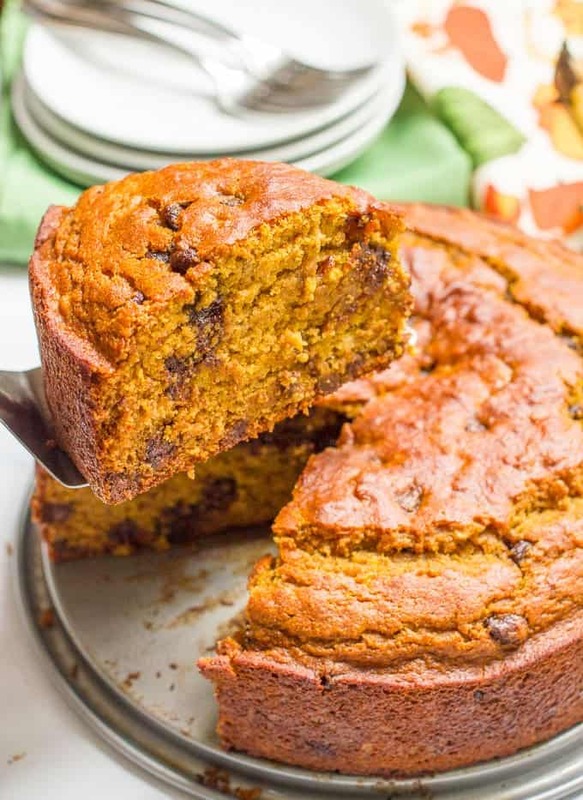 I think I see some yummy dishes (especially this pumpkin bread!) coming out of my kitchen now that the weather is cooling down! So happy you found me Julie! 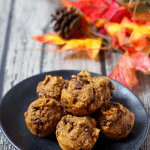 And yay for fall and all the fun baking projects! Hi Heather! I don’t have nutrition info on my site yet, but I’m looking into adding that. I just plugged this recipe into one of the calculators I’m considering and it shows 58 grams of carbs for one slice (if you cut the cake into 12 slices). I hope that helps! Hi Brooke! It might be fine without the butter (it’s not a lot). It’ll lose some richness but if the batter seemed OK, the cake might turn out fine. Crossing my fingers for you! Let me know how it works out! Will this come out well in a bundt pan? Do I just need to bake it a bit longer? Hi Alia! Yes, I would think you could bake this in a bundt pan. It would need to be buttered and floured well, as you mentioned, and probably the bake time would be a bit longer. Would love to hear if you try it!